Here is a little bit of local art which I find interesting for a number of reasons. This piece of sculpture was created about 800ad. 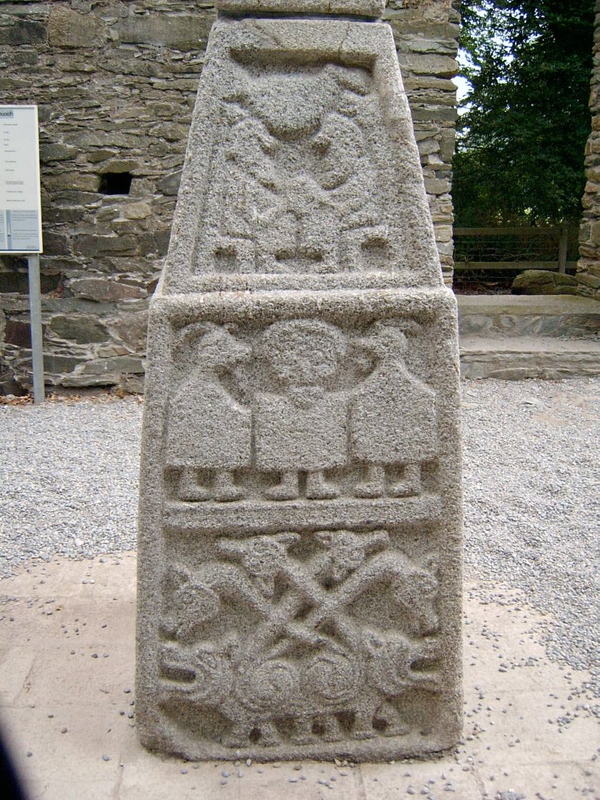 The photo is of the North face of the base of the Moone High Cross. This cross is within the ruins of an ancient monastic settlement close to where I live. In his guide book about the local High Crosses, Eoin de Bhaldraithe, writes about the artistic styles and development of techniques of a group of artists working in this area at that time. Sometimes we forget that the creators of works like these were very much the same as ourselves. This stone carving looks surprisingly modern and would not be out of place in any modern exhibition. However, there is speculation that these ‘sculptures’ were, in fact, paintings. Apparently the figures were painted in a fashion similar to the illustrations in the books of the same era, e.g. The Book of Kells. You will notice that the edges of the figures have details but the inside areas are flat and ‘blank’ so the other details could be painted in. So what we see today are the remains of paintings, as all traces of paint would have weathered away over the last 1200 years. Art works are subject to the ravages of time. Interestingly, unlike the above example its the substrate which deteriorates in old oil paintings and which has to be replaced during restoration. In the short term the greatest threat to oil paintings is dampness which can soften the water based glue size which is used to prepare the oil painting surface before priming. This will cause the paint to flake off and is difficult to repair. So store your masterpieces in a dry place and try not to have anything in contact with the surface which will be slightly ‘sticky’ for several years after the initial drying process. This entry was posted in Oil Painting and tagged Art, Oil Painting. Bookmark the permalink.